History on Paper - This drafting room diary from 1912 records the engineering designs of The Wirt Company. Our history dates from the earliest days of electronics. The Wirt Company was founded in 1904 by Charles Wirt, an associate of Thomas Alva Edison. Wirt pioneered the development of wire wound potentiometers, fixed wire wound resistors, automotive spark suppressors and slide switches. At the same time, engineers at Continental Carbon, Inc., were creating basic processes for manufacturing carbon composition resistors, metal film resistors and carbon film resistors. Following their merger, Continental Carbon, Inc. and The Wirt Company became Continental-Wirt Electronics Corporation and more recently, CW Industries. 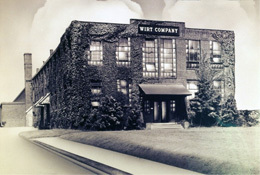 The Wirt Company - Philadelphia Pa, circa 1940. CW Industries today - Corporate Headquarters, Southampton PA.